Your team intubated a 38-year-old woman who was found unresponsive following a poly-substance drug overdose. Intubation was performed without difficulty and no medications were necessary. 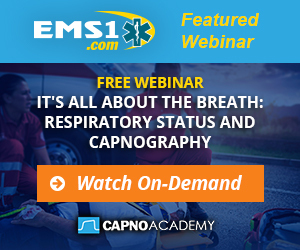 Waveform capnography confirmed correct placement of the 9.0 endotracheal tube. The patient does not appear to be awakening, seizing or in any distress. Your patient monitor however, cannot seem to display a consistent end-tidal CO2 value. Instead, the displayed value seems to be changing moment to moment, varying between 18 and 47 mm Hg. Additionally, the oscillations seem to be triggering frequent ventilator breaths above the assist control/volume control set rate. Thinking these oscillations may be related to “curare cleft” capnogram indentations associated with attempted spontaneous breaths in a mechanically ventilated patient, or potentially related to underlying seizure activity, you administer a hefty benzodiazepine dose without effect. First described in the anesthesia literature in 1961, the rogue waveforms you have encountered are called cardiogenic oscillations (COS). Two important findings were noted in early studies: the oscillations match heart rate and their appearance is associated with decreased airway resistance. In fact, if you were to superimpose the oscillations over the patient’s EKG, the rate of the oscillations will match the heart rate. This relationship led to a theory that cardiogenic oscillations resulted from cardiac pressure waves transmitted through the mediastinal anatomy to the airways. As clinicians increased reliance on capnography for ventilator changes and ventilators evolved to become more sensitive to patient efforts, COS, although rare, became more problematic. Sporadic COS led to lower or inaccurately reported ETCO2; providers sometimes misinterpreted COS for efforts at spontaneous breathing or rebreathing resulting in unnecessary drug administration or ventilator circuit manipulation; COS inappropriately triggers mechanical ventilator breaths in a variety of vent modes; and most recently, COS significantly interferes with capnography based cardiac output determinations. In a search for optimal means of troubleshooting interference, researchers found it difficult to categorize patient populations or situations where COS were most likely to occur. Finally, in 2009, a group of cardiothoracic surgery researchers decided to trace the origin of COS. During cardiac surgery, the chest is open and both pulmonary and cardiac anatomy are completely accessible, so it did not take long for these researchers to discover the actual cause of COS was not cardiac pressure changes, but pulmonary artery pulsations. A few years later, these data were confirmed and explained in more detailed animal studies. The right heart generates pulmonary blood flow in a pulsatile fashion that transmits a wave of pressure along the pulmonary vascular tree. In the absence of significant airflow resistance or with sensitive pressure or airflow monitoring devices, it is easy to see how pulsatile pulmonary artery blood flow could cause both airflow and pressure changes. Airflow fluctuations would be reflected in a capnogram; pressure fluctuations would be detected by pressure sensors in a ventilator circuit. You may have noticed the reference to absence of airflow resistance as a precursor to COS. That finding led to what currently is the most practical and effective means of resolving COS: PEEP (Positive End Expiratory Pressure). Suggested in a case report published in 2000, the addition of PEEP to the ventilator circuit will generally resolve COS interferences with both capnography and ventilator breath triggering. In the opening case presentation, the addition of 5 CWP of PEEP to the ventilator circuit eliminated the rogue COS waveforms. In cases where PEEP has already been applied, slight upward adjustments may be necessary to reduce or eliminate COS artifact. Mike McEvoy, PhD, NRP, RN, CCRN is the EMS coordinator for Saratoga County, New York and a paramedic supervisor with Clifton Park & Halfmoon Ambulance. He is a nurse clinician in cardiothoracic surgical intensive care at Albany Medical Center where he also chairs the Resuscitation Committee and teaches critical care medicine. He is a lead author of the “Critical Care Transport” textbook and Informed Emergency & Critical Care guides published by Jones & Bartlett Learning. Mike is a frequent contributor to EMS1.com and a popular speaker at EMS, fire, and medical conferences worldwide. Contact Mike at mike.mcevoy@ems1.com. 1. Arieli A. Cardiogenic oscillations in expired gas: origin and mechanism. Resp Physio. 1983;52: 191-204. 2. Tusmana G, Suarez-Sipmannb F, Peces-Barbac G, Climented C, Aretad M, Arenasb PG, Bohme SH. Pulmonary blood flow generates cardiogenic oscillations. Resp Phys & Neurobio. 2009; 167: 247–254. 3. Fernando Suarez-Sipmann F, Santos A, Peces-Barba G, Bohm SH, Gracia JL, Caldero´n P, Tusman G. Pulmonary artery pulsatility is the main cause of cardiogenic oscillations. J Clin Monit Comput. 2013; 27:47–53. 4. Marks R, Sidi A. Elimination of cardiogenic oscillations in the capnograph by applying low positive end-expiratory pressure (PEEP). J Clin Monit 2000;16: 177-181.